So that was my swim technique 2 days after finishing Ironman Western Australia. 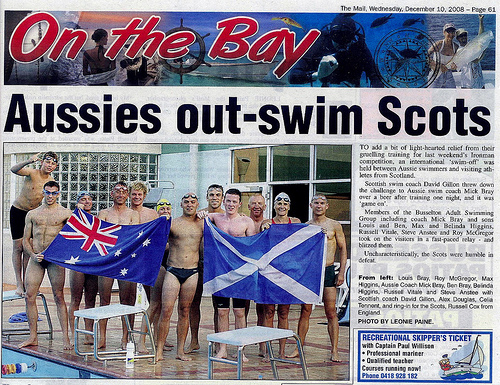 The video footage is thanks to Paul Newsome and Swimsmooth and was filmed at Claremont Pool in Perth. Following on from the experience, aside from the input in terms of stroke correction I found viewing my own technique was a great insight. 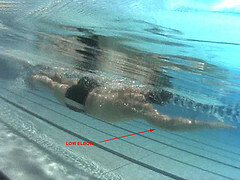 I’d generally consider myself quite aware of issues in the water and of body position. Apparently I’m not as good as I think! Paul pointed out a few things from the video (after telling me the stroke was mostly fine) some glaring obvious. 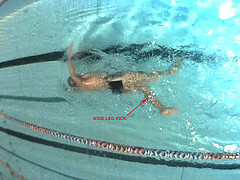 The clearest was the occasional wide kick when my left hand enters the water. I had absolutely no idea I was kicking that wide. All the rest falls into a pattern that links into this kick. Firstly you have a dropped elbow at the catch phase, weakening the effectiveness of the catch. Then you have a wide entry of the right arm which is followed by a twist in the spine and the left hand crossing the mid-line at entry. The flick kick happens in an attempt to balance this all out. All of these technique problems lead me to start next years swim training with a real focus on fixing them. The next month or so I’m not worrying too much about speed or intervals or the like. Instead the focus is lots of careful swimming with good technique and a lot of drills focussing on fixing the issues. Mainly this sees me doing sculling and doggy paddle and really concentrating on the wrist angle to keep it below the elbow. It’s slow and the distances I do in an hour are a lot less than before, but I think I’m progressing. I’m starting to relax into it and get a feel for when it’s going right or wrong. Muscles are aching less then the first few days and it is beginning to feel more natural. I am kicking a lot less right now I’m not sure if that’s not needing to because my balance is better or because I’m so paranoid about that wide kick though! After an initial focus purely on technique and just putting some time in the water I’ll start to work speed back into things. I’m expecting to get here about late January and then continue on from that. They’ll be a technique focussed session once or twice a week. Plus I see drills as part of a long warm up anyway before hitting out into intervals. I think the aim will be a couple of interval/intensity sessions per week, a couple of pure technique focus and then to finish things off a couple of long endurance set sessions. As before I’ll be aiming to swim around 20-25km per week and trying to up that a little once in each training cycle. Volume does help contribute to improving my swimming. That’s really it for the swimming side of things. Nothing radical a mix of technique, intensity and volume. The goal I want to achieve from this? 55 minutes in an Ironman swim. That’s my aim for this year I want to take myself from the 60 minute ranks to the 55 and get just a little bit further ahead out onto the bike course. I’m hoping that technique improvements will help take me to that point along with a continuation of regular swimming. As this is about swimming an aside from my time in Busselton. Whilst training with the local club I somehow got roped into some swim relays as an honorary Scot. Yes, they were desperate enough to allow an Englishman to play at being Scottish. Not that it helped them against the Aussies much. Still this time I really did make the local paper! Oh, Merry Christmas! I should mention it rather than just training! I’ve enjoyed a quiet 90km ride down south along the beaches. Plenty of people out having their Christmas barbies. It’s a little odd to be sitting around in shorts on Christmas day, just doesn’t quite feel right.